Agriculture in Namibia is mainly extensive cattle breeding. Due to long dry seasons a cow requires a large area and a lot of grass to live. At Dornhügel this comes to at least 10 hectare per cow. As a result we have approximately 1000 cows on our 11 000 hectare farm during good rainy seasons. 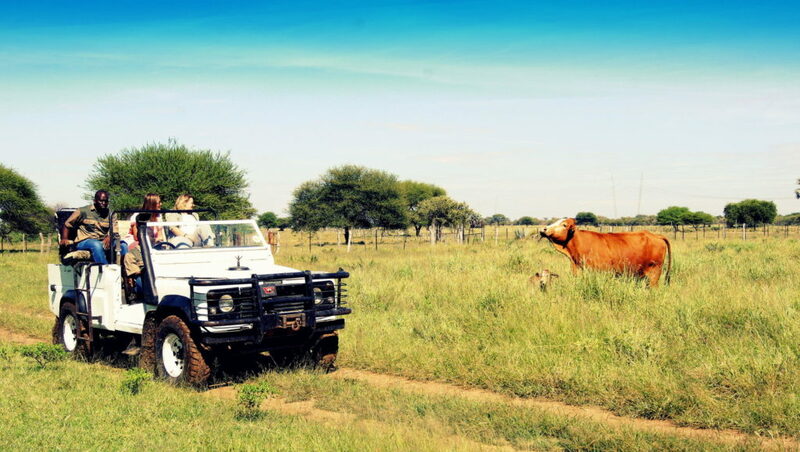 We farm with Brahman, Simmentaler, Angus and the indigenous N´Guni cattle. Due to the low-calorie feed the cattle grow slowly which guarantees possibly the best meat quality in the world. In addition to our cattle Damara sheep, dogs, cats, ducks and chickens are part of the farm. A special feature is our Basotho horse stud. Dornhügel is a family-owned farm in the third generation. 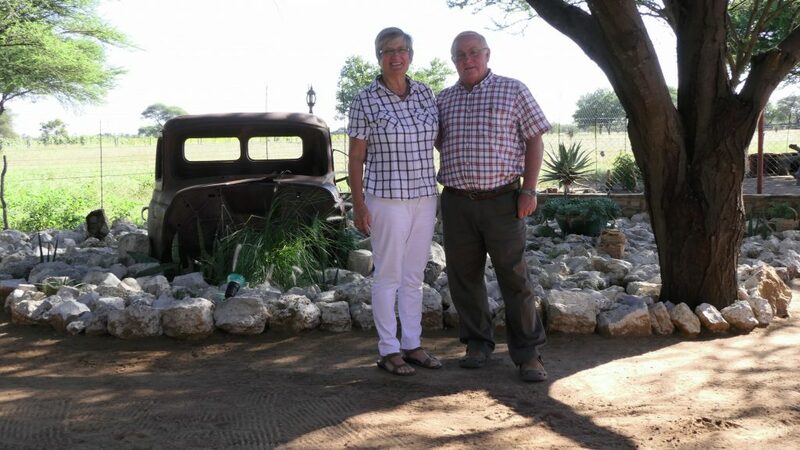 Irmgard and Max Beyer manage the agriculture. 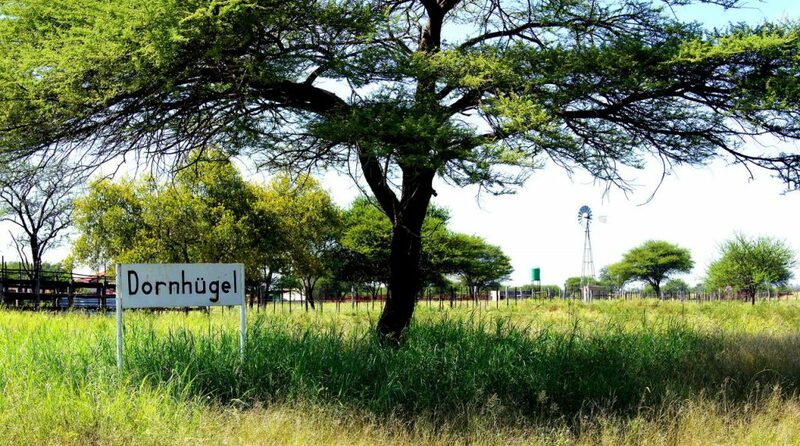 Dornhügel is a real family business which is evident all over the farm. The path from calf to grown cattle is a difficult one and it involves mastering many challenges. Drought, heat, bush fires and predators such as the leopard pose just one of many risks. Farms in Namibia are very unique and we want to give you the opportunity to find out as much as possible about them. To achieve this goal we have a range of activities prepared for individual preferences. During a 2 or 3 hour drive we will show you large parts of the farm. You will find out where we get our water from and how it gets to the watering holes distributed over the farm. You will get to know our different varieties of cattle as well as our Basotho horses and the Damara sheep. See the old red stone building, which today could well be the backdrop of a western movie. Experience the diversity of wild animals that live in harmony with the agriculture. The elegant jump of the Kudu over the fence will render you speechless. The Kudu can jump off the cuff two meters far and also high. It is a memorable experience to discover Dornhügel on foot. While walking along the Makalani palm tree way you will pass the stately termite mounds and our central agricultural buildings where you can witness the tasks our team has to master every day. The trail also leads you to the picturesque hills that gave our farm its name. For those that want to know exactly what they are capable of, we have a special offer. Become a farm hand for one day (or just a few hours). De-bush the fields in the glaring sun, supply the cattle with water, repair the fences or drive our bulldozer when our roads have to be improved. You can be sure that no sundowner has ever tasted as good as the one you will have during that evening. Feel free to ask us about any upcoming events that you might be able to attend. Maybe you are in luck and can accompany us to a cattle auction or be involved while the auctioned cattle are unloaded and get their brand. You can also be present while a calf is being born. Long conversations next to the bonfire give you an insight into the country and its people that you will get nowhere else. Under the Southern Cross you can discuss and deepen the experiences of the day.